Full Size: 24" x 17"
Georgia-Pacific 29616 Brawny Industrial Dusting Wipe - 24" x 17"
Janitorial dusting wipe is specially treated with mineral oil to attract dust for quick and easy dusting duties. 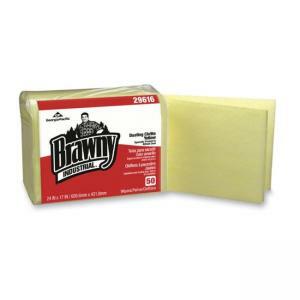 These larger, economical wipes are made from carded rayon material to provide excellent tensile strength for longer, more effective use even when wet. Wipes come in space-saving, moisture resistant poly packaging.